This photograph may look as if it was completely out-of-focus and taken with an awful, possibly broken lens. Although you are free to question the merits of this composition, the very features that seem strange are intentional and probably not what you think they are. Most importantly, I have taken and now show this photograph mainly because it illustrates a use of the lens shift function, which I have discovered by chance while "playing" with my new tilt-shift adapter. 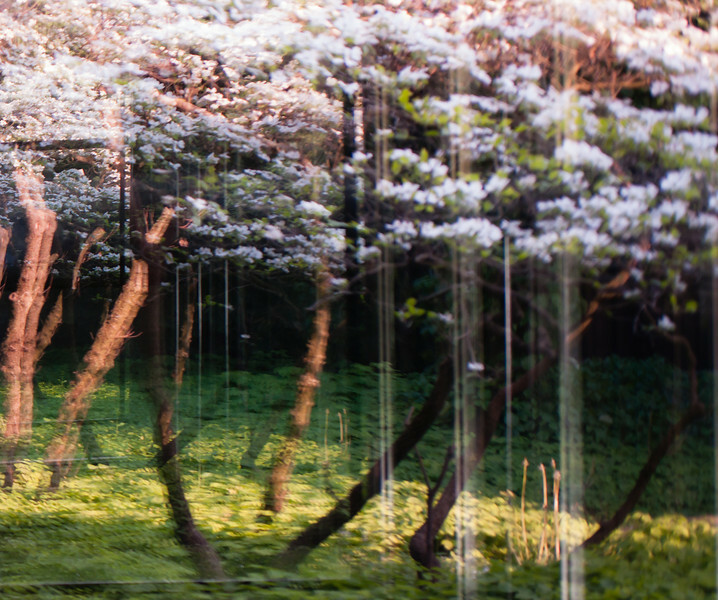 What you see in this composition are not actual flowering dogwood trees, but rather their reflection. This is also the reason for the strange "shadow trees" that you may discern. The vertical lines across the whole photograph are door frames and door handles behind the window pane that was reflecting the trees. What was the shift function used for, you may wonder? It was necessary to photograph this reflection without myself appearing in it. The tilt-shift adapter thus served as an auxiliary, tiny periscope. Careful positioning of myself and the 15 mm of shift prevented my appearance on the left border of this photograph, which would have been very distractive (in my opinion), because I was wearing a red jacket. Just go and overcome your laziness!